Gujarat University, Navrangpura, Ahmedabad- 380009. 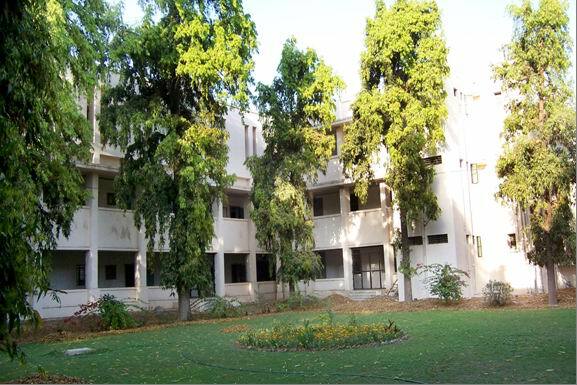 The Department of English of Gujarat University was started in 1963 in the present building of the School of Languages. In those days this used to be the School of Gujarati (Gujarati Bhasha Sahitya Bhavan) Dr. R.S. Singh, who later joined Kurukshetra University and rose to Professor-Headship and Registrar (Academic) ship, was the founder Lecturer-Head of the Department. He joined the Department in June 1963. After a few months Professor K.R. Chandrashekharan (Oxon) joined the Department as the Professor-Head in November 1963. Thus after thirteen years of University's inception the English Department came into being. For four initial years the Department ran on the strength of just one lecturer and one professor. PG teaching in those days was done only during the week-ends - two days a week. As the School expanded and other Departments came into being the teaching pattern changed. With the help of Visiting Faculty from the affiliated colleges, six days a week teaching was introduced in all the Departments. Full-fledged M.A., Ph.D. Programs in English were introduced. Under Professor Chandrashekaran’s insightful leadership the department expanded, Dr. B. Singh joining the department in 1967, Dr. D.N. Mehta in 1970 and Dr. Amina Amin in 1977. The department with such distinguished faculty with varied interest developed into a major Centre for English Studies in Gujarat, teaching P.G. as well as catering to the needs of the affiliating PG Centres. In 1970, Prof. Chandrashekaran also took over as the Director of the School when Shri Umashankar Joshi, the renowned Gujarati poet and the then Director was appointed as the VC of Gujarat University. Prof. Chandrashekaran retired in June 1977 handing over the charge of the Department to Dr. Digish Mehta (a Reader at that time). In Sept. 1977 Professor R.A. Malagi was appointed as the Professor-Head. Keeping the twin objectives of the Department in view, viz. the Language Teaching and Literature Appreciation and Research, in 1981 under Prof. Malagi's leadership the Department introduced M.Phil. Program. In 1985 the present Language Laboratory, situated on the second floor of the USL building, was installed under the supervision of P.K. Thaker, Reader Language Lab. A decade that followed this was a decade of serious research guidance and full-swing ELT activities. In-Service-Teachers' -Training Programs for the affiliated lecturers, ELT Workshops and ELLT Courses became a regular feature during that period. More than fifteen such Programs must have been given during that decade. Though basically a PG Department, the diverse specialization of the faculty, as shown below, provided the affiliated PG/UG teachers with much needed guidance and support. Each of the faculty had, besides teaching, numerous papers presented at National/International Conferences and Seminars and significant book-length studies. The period since 1992 saw superannuation of the senior faculty. But this has been compensated for by the entry of newer and younger faculty with still newer and varied areas of interest and under; their thrust areas are in keeping with the changes witnessed in the English Studies in the overall set-up of the academia. The department aims to provide a nucleus of intellectual activity in English studies in Gujarat. Its goals and objectives are set in the light of its situation in the overall educational context of English Studies in Gujarat University. Ours is an affiliating Univ. spreading over about the whole of Gujarat and covering 187 colleges in Ahmedabad city and around. Colleges in different regions of Gujarat all of which are teaching English as compulsory subject at UG. The Departmental Head bring an ex-officio member of the Board of Studies, the Department, in a way, also steers the formation of Compulsory Courses. Moreover we have more than fifty affiliating PG Centres in English, three of which are in Ahmedabad city itself. The responsibility of putting up standards and giving guidance and help to such Centres naturally lies on the Department. The twin objectives of the Department are : 1. Language Teaching 2. Literary Appreciation and Research which are relevant to contemporary disciplinary demands. It also aims at giving Outstretch Programs for working outside the institutional structure of the University by giving/designing Courses for professional centres like Nirma Institute of Technology and Ahmedabad Management Association. The Department has recently also taken over the responsibility of designing and giving Refresher Course in English Studies for the lecturers of affiliated colleges. The 1st Refresher course of the University was given in Nov. 2000 (Nov. 2 to Nov. 19, 2000) under the Coordinatorship of Dr. Ranjana Harish. The department also aims at promoting interaction between the University, Faculty, students and the people of the city at large by holding events like staging of plays or cultural events - which are educative as well as entertaining. This department is a P.G. dept giving M.A., M.Phil. and Ph.D. Programs. The M.A. Program is of two years i.e. four academic terms duration. At the end of every year there is a University examination. Each year students study four papers. Thus the total number of the papers studied by an M.A. student is eight. Out of the total eight papers four are Core Courses which are compulsory for all (paper I & II in Part I and paper V and VI in part II). These four courses are the ones which impart knowledge about English Studies which any M.A. in English ought to have. The focus here is on Literary History from the earliest to the contemporary, British Literary Texts and Critical Theory. The remaining four Courses are electives where a student could choose according to his/her interest. Some such elective Courses are: Indian Writing in English, American Lit., Commonwealth Lit., Women's Writing, Medieval Literature, Classics in Translation. Indian Writing in English Translation, English Language and Grammer, ELT, ELLT. Though it’s difficult for the department to offer all the options due to insufficient strength of the faculty, we have been offering most of the Courses with the help of our Visiting Faculty from the affiliated colleges in the city. All the Visiting Faculties are recognized P.G. Teachers. The M.Phil program is designed in such a manner as to train students in methodology and in theoretical and conceptual grasp of the issues. A student has to take three Courses in all for an M.Phil. Out of the three one (Research Methodology) is a Core Course, the remaining two are electives. Out of the two electives one becomes the area in which the student writes his/her dissertation for the degree. The department offers wide range of choices/combinations and often designing courses to cater to the needs/interest of individual students. For example two years back in 1998, when Women's Writing Course had, for the first time, two male students, the course was re-designed and it focused on Writing Differences and Masculinist Studies. The Ph.D. Program is designed differently for each research scholar. The department promotes inter-disciplinary study. The teaching/learning experience of the department rests mainly on three components 1. Class-room teaching 2. weekly seminars/classroom presentations by students 3. language laboratory sessions given to smaller groups of 12 to 15 students. Out of the above three components two have large number of students, around 75 to 100 which doesn't leave any other means of communication except lecturing. We have felt a need to be able to restrict the number of the students. And we definitely believe that if the number could be controlled the teaching/learning quality will definitely improve. Class presentations, seminars, discussions and Weekly Seminars, on every Tuesday, are the strongholds of the department's learning evaluation. It has not only trained and enriched students and gave the faculty feed-back but has also inculcated a sense of solidarity among students. For the evaluation of learning we have several in-class devices as above in addition to the internal tests. We are glad that despite the fact that no weightage is given to such evaluations in the final University examinations we have been able to create a right climate for such exercises in the department. Unfortunately there is no teaching evaluation mechanism available. At present Faculty Evaluation is done in our university only by the participants of the Refresher Courses. We have found such a feed-back very useful. Hence we wish to evolve a system of Faculty Evaluation at M.A. and M.Phil. level also. Research is the most important function of the department. Admissions to Ph.D. are restricted to smaller number about 3 to 4. The M.Phil. Program, in a way is a preparatory program for Ph.D. which admits 10 to 12 students chosen on the basis of entrance test, interview and M.A. result. The Department has by now produced around 20 Ph.Ds. and 30 M.Phils. The Faculty have been actively involved in Extension Programs through different Departments of University itself, like Department of Journalism, EMRC, H.K. Professional Training Centre and also through Open Universities like IGNOU and Ambedkar Open University. In addition they are also on the advisory boards of institutions like Ahmedabad Management Association and Nirma Institute of Technology and All India Radios (for their programs in English). We believe the Department's strength lies in its Faculty's achievements, and the Department is proud of its contribution to the quantum of English Studies through its Faculty. Within last ten years the Faculty have published more than 25 articles and four books Indian Women's Autobiographies (1993), Female Foot Prints (1996), The Silverlining (2000) and The Tongue of Fire (2000). Three more books are in progress and two are in press. In addition to the above publications, the English the Department has been doing considerable work in English-Gujarati, Gujarati-English translation also. Classics in English like Virginia Woolf's A Room of One's Own and Mulkraj Anand's Untouchable and Narsinh Mehta’s Dalit literature are translated and published by our faculty. The faculty has at least seven translated books to their credit within last ten years. The department is also proud of their former faculty Prof. Digish Mehta whose novel Aapno Ghadik Saang (in Gujarati) is awarded a gold meal this year (2000). He is a recipient of several other awards also. Dr. Ranjana Harish's translation of Untouchable also was awarded 1st Prize by Sahitya Academi (1996). The Faculty have also been awarded reputed Fellowships like Indo-Canadian Shastri Faculty Enrichment Fellowship and Indian Institute of Advanced Study's Fellowship. This department is the first in Gujarat to introduce Women's Writing at UG and PG in early 90's. Since then the department has designed several Courses in the area for B.A., M.A. and M.Phil. It has produced Ph.D.s and thus has created a space for itself among Gender Studies academics. As mentioned earlier the English Department is situated within the larger umbrella of School of Languages, which has its advantages and disadvantages. It provides a greater opportunity for interaction among other language departments. At the same time it brings certain curtailment on the role of the Department which it would have liked to play otherwise. Every faculty has computer/ printer facilities. The heads also have Internet and intercom facilities. We also have Departmental Library as well as the personal collection of the famous Canadian dramatist James Reaney. In addition to teaching and testing at M.A., M.Phil. and Ph.D., the department is seriously devoted to publication and pursuit of knowledge through holding National and International Conferences, Seminars and workshops. To improve the quality of English studies in the affiliated colleges the Department has organised five UGC Refresher Courses between 2000 – 2006. Under the UGC’s teacher’s exchange scheme, renowned professors like Prof. Jacob Tharu (CIEFL),Prof. P.K. Rajan (VC., Kunnur University), Prof. Krishna Swami (CIEFL), Prof. Jamila Begum (Kerala University), Prof. K.K. Gautam (IGNU, Jammu) and many others have lectured in the Department. Number of papers – 60. Number of Resource Persons -25. Guest of Honour:- Ms. Jnanpith Awardee Dr. Indira Goswami. 2. MHRD National Conference entitled ‘Re – Defining Feminism/s’ Oct. 16-18 2005. Number of Regd. Participants -160. Number of papers -30. Number of Resource Persons 15. In addition to the above, the Dept. hosted five Inter/National Events under the banner of Reaney Canadian Centre in 2002, 2003, 2004, 2005 and 2006. Over five years period, the faculty has published more than five books and about 12 research papers in National / International Journals in individual capacity. 2. Shakti (In Gujarati) Ahmedabad: Gurjar Pub., 2004. This too was a refereed Volume ed. By Ranjana Harish , Darshna Trivedi and Nutan Damor. Forthcoming Volumes:- Three Volumes based on our International Events during 2002 - 2005are under preparation for Publication . Areas of Specialization : English, American Literature, Translation, ELT.